You may wonder if I’ve lost my mind. But no, let me reassure you. My mind’s intact or reasonably so, and my sense of humor hasn’t yet evaporated. This message was one of the 500 or so I received August 10th. I was going to include it under my Sunday Funnies, but I had to save it because it deserves a headline all its own. And besides, the newsletter doesn’t have a Reverse Chutzpah section yet. Your senators are probably the very people whose greed and insouciance may have put us on track to trashing all life forms on this little speck of dust in a universe that’s probably full of other such specks of dust, with—hopefully—more rational creatures inhabiting them. Greenhouse Gasses Continue Their Massive Rise. Writing a New Chapter, Not an Obituary for the Planet. Every tree that is here is a seed I planted. Here began the history of Pouso do Rochero, Brazil. My name is Antonio Vicente. I am 83 years old. When I was a child, I used to tell my neighbors that the water was going to run out. In 1973, when I bought [land] here, this was all cattle pasture. The water springs [had] dried up and never returned. So what did I do? I left the countryside to go to the city. I worked very hard to buy this land. And I started replanting, and then the water springs started coming back. Today I have 76.7 acres of land here all reforested with native plants. [Today] there are eight waterfalls here that have all been recovered. So this was what I wanted to do. This is my family! This is our Family, too: the water, the soil, the trees, the animals, even if some of them are human beings who need drastic psychotherapy right about now to help them deal with their delusions. Oppose Urban Shield in your city. Turn out against Kavanaugh nomination. Small Iowa town, hosting one of 15 immigration bond projects nationwide, frees 21 immigrants. Massachusetts’ Sanctuary in the Streets supports dozens of families and individuals facing deportation. Scientists discover way to accelerate formation of magnesite which stores carbon as it crystalizes. California prisoners help develop a remedy to unjust detention conditions. San Francisco becomes first city on U.S. to open a Safe Injection Site. San Antonio becomes 33rd U.S. city to vote 9-2 to pass a sick leave ordinance. As part of a broader effort toward economic and racial justice, Public Bank, N.Y.C. launches campaign to create municipal public bank. Incarcerated People declare national prison strike to demand humane living conditions and an end to slavery in prisons throughout the U.S.
After years of advocacy, NYC’s Council’s Environmental Committee Chair announces he will push toward reducing pollution from large buildings by over 60% by 2050. Top-ranking Michigan official order to do jail time over Flint water crisis. Landmark Seventh Circuit decision says fourth amendment applies to smart meter data. Amid backlash, Georgia officials defeat racist plan to eliminate polling places in Randolph County, a black-majority county. Sierra Club launches ad campaign against Trump administrations effort to bail out dirty coal plants. Internet activists turn up the heat on Salesforce over border patrol contract. Judge slams Energy Transfer Partners for baseless lawsuit against Earth First! Yemeni man granted Muslim B an waiver, reunites with family after 17 years. Wales lets people build their own eco-homes in the countryside. Center for Biological Diversity wins restraining order to save wolf’s life from Washington State officials. Mudgirls work to spread the word that even new mothers can build their own home off the grid. Hundreds of immigrant kids and parents join rapper Logic onstage to shine a light on the struggles of separated families. Militant N.Y.C, taxi drivers union wins landmark legislation forcing Uber and Lyft to pay drivers a living wage. Supreme Court declines to suspend proceedings in landmark case pitting a group of youth plaintiffs against the federal government for dragging its feet re: climate change. L.A. tenants lead largest rent strike in history. University of North Carolina students topple monument to white supremacy. As Trump military parade canceled, peace parade goes forward. Lucas Aerospace plans conversion from military to peaceful production. National Association of Letter Carriers urges congress to pass legislation reducing pollution of the atmosphere causing global warming. AB2772, creating a statewide grant program for school district to pilot ethnic studies, moves our of Senate Appropriations Committee to go on State Senate floor. Berkeley’s 1951 Café helps refugees by allowing them to practice English while serving customers, and placing them in job after their training. Court stops North Carolina GOP from stripping candidate of party affiliation just to win judicial race. Urged by advocacy, senators pass AB 2923 out of committee helping to insure denser housing is built next to transit hubs. Circuit Court orders EPA to stop delaying and implement the chemical disaster rule. Chase Iron Eyes, one of the Native leaders of Standing Rock, has his serious charges dismissed, and will not face six years in prison. Federal Court rules against Ohio’s gerrymandered districts. Legislative committee indefinitely postpones hearing on extending the California State Water Project contract. In Vermont governor’s Democratic primary results transgender candidates win. Gaza fisherman battles poverty (and Israeli restrictions) with plastic bottle boat. Israel allows Gaza mom to accompany toddler to cancer treatment. Demonstrations in solidarity with the prison strike take place in Tacoma, Washington as supporters march through the University of Washington which has contracts with Correctional Industries. Activists try successful anti pipeline strategy developed in N.Y. State in Oregon. California net neutrality bill SB 822 clears committee hearing to speed to gull Assembly vote. Women win the Democratic primaries at twice the rate of men. Under legal pressure from the Center for Biological Diversity, Siskiyou County suspends its contract with Wildlife “Services”, an entity that managed to kill 28,000 animals in the county over the past decade, and 3 million nationwide every year. Ninth Circuit rules that U.S. Fish and Wildlife Services refusal to protect the grayling is unlawful, failing to consider climate impacts. The Trump administration agrees to a settlement with the Center for Biological Diversity requiring federal agencies to prepare management plants to keep California rivers free-flowing and wild within three years of their designation. A new set of principles known as the Toronto Declaration aims to put human rights front and center in the development and application of machine learning technologies. Full U.S. Senate approves fiscal year 2019 public media funding. After fatal shooting of Antwon Rose, East Pittsburgh ponders eliminating entire police force. Ride-sharing app teams up with nonprofits to provide discounted election day rides to the polls. Jackie Hill is the first African American woman in history to be elected in Blount County Tennessee. More than 20 U.S. cities issue IDs to protect undocumented immigrants. Floating tidal stream turbine off Orkney produces more green energy in year than Scotland’s entire wave and tidal sector produced in the 12 years before it came on line. Young Kerala girl give up all her savings to help Kerala flood victims. Last week in L.A., the national TPS Alliance along with Mayor Garcetti, launched the TPS journay for Justice,, a bus traveling cross country visiting over 50 cities in 12 weeks to save TPS. Federal judge orders Trump to restore DACA. Federal court rules that unaccompanied children immigrants should be able to apply for visas without the participation of their absent parent. Jury wallops North Carolina hog farm again for its negative impact on neighboring residents. Portuguese administrative court rules in favor of the Algarve Fossil Free platform’s injunction, and suspends license for ENI/GALP consortium to drill for oil off Aljezur. Today’s blog might appear downright scary, especially to those who believe there’s no cause for concern, but good and courageous people don’t deserve to have scare tactics used against them. My intention here is not so much to scare you, but to affirm your right to know. Some time back, I hastily scanned a headline which seemed to indicate Noam Chomsky wanted to address the same theme, but I cannot find the article. What I have found is a talk by Chomsky opining that the two greatest dangers facing humankind (and presumably other animals and plants of a non-human-kind) are global warming and nuclear war. I want to offer the opinion here that the greatest danger facing livingkind is global warming acting in concert with the nuclear apparatus of both the war-and energy-making kind. 1. The economic rationale for establishing a nuclear plant (there are some nearly 95 still chugging away in the U.S. and irradiating the air, ground water, and soils wherever the wind takes their ventings) is to supply the nation with enough weapons-grade plutonium to keep the nuclear war program in full swing. 2. Water: Fuel rods, whether they are located within the reactor itself or in “spent” fuel pools require cooling water at all times. As the planet heats up with the burning of fossil fuel (and the U.S. armed forces are one of the worst global polluters) water no longer has the capacity to keep those nuclear plants cooled. For example, during the last month, some reactors in France and Finland had to be temporarily shut down because the water had become too warm to cool them. 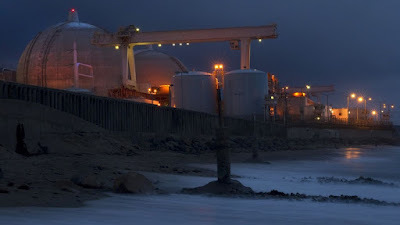 Or consider the potential of some accident as nuclear waste is transported over land or water, as a plan proposes for the Great Lakes; or Edison’s storage plans for San Onofre’s nuclear waste which place it barely above the level of seas which promise to rise. 3. Fires: As fires continue occurring and spreading with greater frequency, they run the extreme danger of reaching irradiated ground, such as, for example, the land surrounding the nuclear weapons lab at Los Alamos, which they did in 2011. 4. Which leads me to conclude that the nuclear war we dread so much may not be in the form of an active fire exchange so much as a slow war presently being waged passively against all forms of life on Earth. Popular Resistance carries an article titled the Suicide of Capitalism which makes the point that “capitalism thinks that there is absolutely nothing to worry about, that whatever it’s doing will result in no harmful outcomes, and that anyone who tells it not to do such a thing is a hoaxer of the worst order. Inadvertently killing oneself with a loaded handgun is bad enough. What capitalism is doing of course is far worse. Not only will it kill itself as a system, but it will likely take our species along with many others right along with it.” Another article says we have time for life on Earth till 2026. 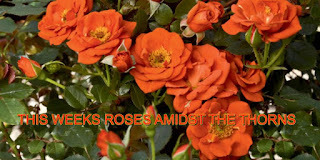 We can do nothing at all to curtail the emission of greenhouse gases into the atmosphere, and if it turns out that these emissions were in fact the leading cause of all the extreme weather phenomena, then we’ve lost the earth and life as we know it. So, are you a gambler? Protest war in all forms, and nuclear war actively by joining Code Pink or any other organization working for peace. Become an active anti-nuclear activist by monitoring the Nuclear Information and Resources website, and following its suggestions. Become an active member of 350.org. 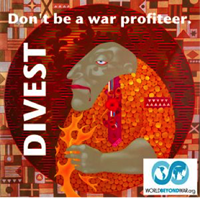 Tell our leaders: take the no fossil fuel money pledge. 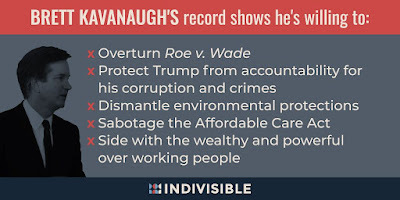 Join your neighbors on August 26 opposing the Kavanaugh SCOTUS nomination. India’s Karnataka province produces more renewable energy than the Netherlands. With Tesla’s help, the island of Samoa is going 100% renewable. Thanks to advocacy, Levi’s makes an ambitious commitment to tackle pollution in its supply chain. Renovagen, a UK company, markets solar panels which can be rolled out from a trailer. Clean up of the Great Pacific Garbage Patch begins. After a ten-year-long campaign, the Ninth Circuit Court of Appeals rules that the EPA must ban chlorpyrifos, a toxic pesticide linked to brain damage in children. Monsanto is ruled “guilty on all counts’ and ordered to pay $289 million in Roundup Cancer lawsuit. French flower cultivator demonstrates method of providing water to growing plants in the midst of drought conditions. In just five years, China plants 83.5 millions acres of new forest, saving animals from extinction. Chinese scientists have invented solar panels that can generate power at night. Physicians for Social Responsibility announces Arjun Makhijani, life-time anti-nuclear activist and president of the Institute for Energy and Environmental Research, received their 2018 Visionary Leader Award. Discovery of resistant corals off the coast of Sulawesi may teach scientists how to save reefs around the world. New Zealand Proposes planting 1 billion trees to fight climate change. Dominica launches one of the strongest plastic bans in the world. 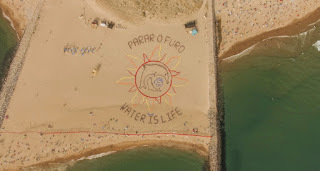 “Aerial Art Action” demands end to planned fossil fuel extraction in Portugal. 65 California communities opposed offshore drilling plan. Chicago’s NEIS spends a year planning a Congressional briefing on the “Age of Decommissioning” nuclear reactors and dealing with radioactive wastes. A federal appeals court’s ruling finds U.S. Forest Service neglected its long-standing concerns regarding soils erosion and orders work on the million-dollar Mountain Valley Pipeline to stop. Citizen groups sue Atlantic Coast pipeline, taking aim at the federal certificate that undergirds all other permits for the complex interstate gas project. Court rules that Chevron must pay for environmental mayhem in Ecuador. In coordinated editorials, hundreds of newspapers denounce Trump’s attack on media. Although unreported, the Time’s No. 2 lawyer tells a group of judges that a prosecution of Julian Assange could have dire consequences for The Times itself. Thanks to advocacy, the Sinclair-Tribune merger is derailed, kicked to an administrative hearing process that signals its death knell. Mexican journalist Emilio Gutiérrez Soto is freed from detention. Senate Dems demand immediate action to reunite immigrant families torn apart by Trump. A group of refugees from Central America facing beatings and abuse in detainment launch a legal battle against ICE, the GEO group’s private prison, and the City of Adelanto, and its “concentration camp” prisons. Federal court orders broad changes in how the U.S. detains and treats migrant children. Appeals board ruling hands Kansas dad who faced deportation a ray of hope as reported by Daily Kos. Elizabeth Hotzman addresses a letter to Kirstjien Nielsen, Secretary of Homeland Security urging her to resign. Lancaster County, PA., says no to GEO Group, a for-profit prison company. 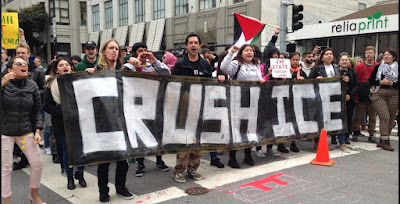 Cosecha’s anti-ICE protests target Northeastern contract with ICE. A recent Supreme Court decision causes some deportation orders to be tossed and cases to be thrown out in a procedural issue over how to properly provide notices to immigrants to appear in court for deportation hearings. District Judge John Bates rules the DACA program should be fully restarted. New Zealand company makes a 4-day week permanent after trial success. Domestic workers in Seattle win most comprehensive Bill of Rights in the U.S. In Indianapolis, entire construction crew walks off the job after racist boss fires Latino co-workers for confronting him. Thanks to unions, Disneyland’s non-union workers are getting a big raise. Voters reject Missouri right-to-work law. For four hours, the Kings Bay Plowshares appeared before U.S. Magistrate Stan Baker arguing that all charges against them be dropped based on the Fifth Commandment: Thou Shalt Not Kill. Indiana church replaces “detained” immigrant Holy Family with new display—your own reflection. In the face of massive community opposition, the BLM suspends plans to capture and remove the wild horse herd from Gardnerville, Nev.
Thousands of small businesses join day of action for net neutrality. Extradition of Catalan leader fails, calling for resolution in which King Carlos offers to negotiate. After 432 days behind bars, Taner Kilic, honorary chair of Amnesty Turkey, has been released. Kochs admit single payer health saves trillions. Health costs would go down, and wages would increase. U.S. District court Judge Beryl A, Howell rules against bundling super pac donations to political candidates, invalidating Federal Election Commission (FEC) regulations that allowed contributions to so-called dark money organizations to avoid disclosure. Kansas City doctors team up to pay off $1.4 million in medical debt for local patients. Medical marijuana initiative is filed in Mississippi. Voters in Vermont, Connecticut, Minnesota, and Wisconsin cast their ballots, nominating impressive women candidates, Christine Hallquist, Jahana Hayes, Ilhan Omar, and incumbent Tammy Baldwin and Amy Klobuchar. Senator Tina Smith, former lieutenant governor of Minnesota, secured the Democratic nomination ahead of a special November election allowing her to serve the remainder of her term and union organizer and ironworker Randy Bryce wins Wisconsin’s first district primary hoping to replace Speaker Paul Ryan. And in Wisconsin progressive candidates Mandela Barnes, Marisabel Cabrera, Jeff Smith, and Sarah Godlewski win big. Calling into question Trump administration’s claims that continuing reliance on fossil fuels is necessary for energy dominance, only 1% of offshore drilling leases sells at auction. Fox News correspondent resigns amid reports that network staff are sick of acting as a Trump propaganda channel. Bob McCulloch, the Missouri prosecutor who refused to indict Michael Brown’s killer, loses race to Wesley Bell in epic upset. Sharice David, a Kansas Democrat could become the first Native American woman ever in congress. With the help of activists the Carl D. Perkins Career and Technical Education Act guaranteeing federal funding for school equality regardless of zip code, is approved by both houses. 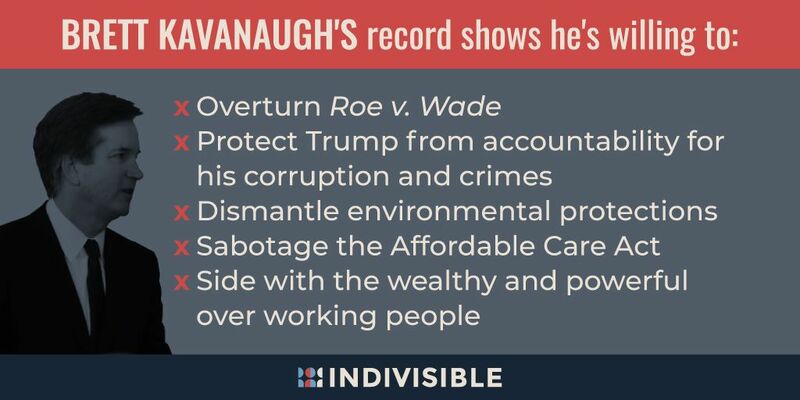 Watchdog groups call for access to all records of SCOTUS toxic nominee Kavanaugh. Chicago may become the largest U.S. city to try universal basic income. Under a new Government-funded scheme, male, pale and stale university professors to be given reverse female minority mentors to help them confront their own biases. And best rose of all, following 187 organizations calling for a mass protest, AP reports that Trump’s $92 million military extravaganza is postponed—to next year.